It seems that some of the telephone numbers used by Omega Marketing Services Ltd were also used by MYIML Ltd who were previously fined by the ICO for calling numbers registered on the TPS. 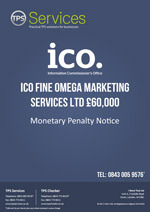 It was this ‘coincidence’ that first led the ICO to Omega Marketing Ltd. It seems that Omega Marketing Services Ltd simply took over from where MYIML left off by taking over MYIML’s telephone account with the service provider and simply changed the name on the account to Omega Marketing Services Ltd. Between 14th October 2015 and 31st March 2016 there were 177 complaints received from consumers registered on the Telephone Preference Service (TPS) register equivalent to £338 per complaint. 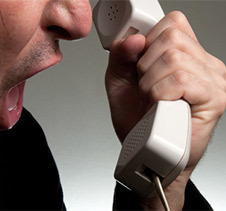 Omega Marketing Services Ltd had no right to make these calls and, in doing so, they caused frustration, anger and upset. That’s why we took action. And the people they were calling took action too – they took the time and trouble to complain and it makes a difference. It helps us identify patterns, trace hidden numbers and build up a case against rogue firms. Ultimately, when people complain, we have a better chance of tracking down the rogue companies and stopping the nuisance.